Leonid Afremov is an internationally recognised modern impressionistic artist who mainly creates paintings with a palette knife and oil paints. Born in Belarus in 1955, Leonid found his passion for art at an early age. His Jewish parents, Bella Afremova and Arkadiy Afremov noticed his talent and encouraged him to develop his skills. He would attend as many art classes as he could at school and engaged in private lessons with local artists. After graduating high school, Leonid attended Vitebsk Education Institute where he studied arts and graphics. It was here where he was exposed to the work of Marc Chagall, Picasso, Dali, Modigliani and the 19th century French Impressionism. All of which reflect in Leonid’s vibrant works of art today. After college, Leonid Afremov settled down with his wife, Inessa Afremova and they started a family. Meanwhile, his career began as a label designer for a local beer and liquor factory before becoming a set designer for a local theatre. In the early 80’s Leonid took on freelance work during the spring and summer for farms and schools. He designed and made various propaganda posters as well as creating themed rooms and walls for their events. In the winter, he would create paintings at home that were not allowed to go on show at government exhibitions because of his Jewish heritage. Instead, they were privately sold or given away for free. After begin affected by the Chernobyl disaster in the mid 80’s, the Afremov family took the opportunity to move to Israel in 1990. However, because of being a recent Russian immigrant, Leonid still struggled to sell his art. During this time, he was unable to experiment and only produced work with acrylic paint and watercolours as it was what the people wanted. His son, Dmitry helped sell his father’s work with door-to-door sales and they soon created enough funds to open a gallery and frame shop in Ashdod. Soon after, Afremov was able to establish his identity and began experimenting with a palette knife. In 2001, Afremov's gallery was completely vandalized. This led him to start a new life in the USA the following year. Although he had a few sales from galleries, Leonid Afremov was still unable to produce what he loved. It wasn’t until 2004 when his youngest son, Boris graduated from high school that he was introduced to eBay. The people loved Afremov’s paintings and immediately, he saw a positive response. He started to make hundreds, sometimes thousands of dollars! After a challenging start to his career, Afremov was finally seeing results. Today, the family live in Playa del Carmen near Cancun where his sons’ run the established business. There’s no doubt that Afremov could have given up on his passion on many occasions. He’s now creating art that he loves and also what the people love. In a statement on Leonid Afremov’s bio, his paintings generally reflect certain personal memories and emotions. He travels a lot and captures moments with photographs that he then translates into paintings. 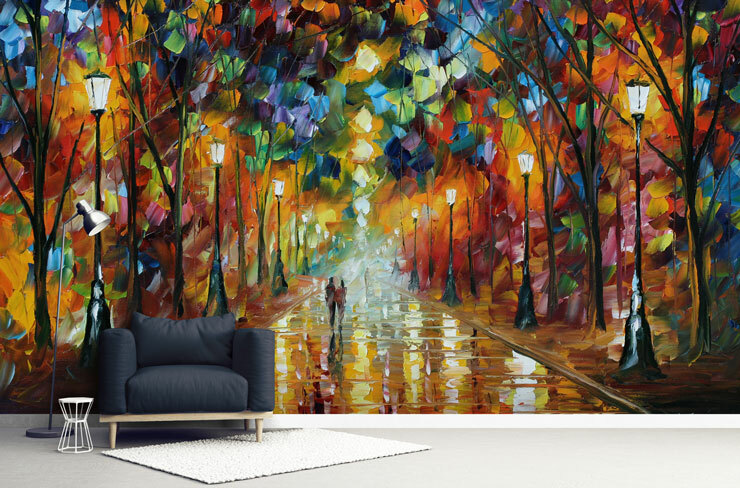 Leonid Afremov joined Wallsauce a couple of months ago from when this post was published. 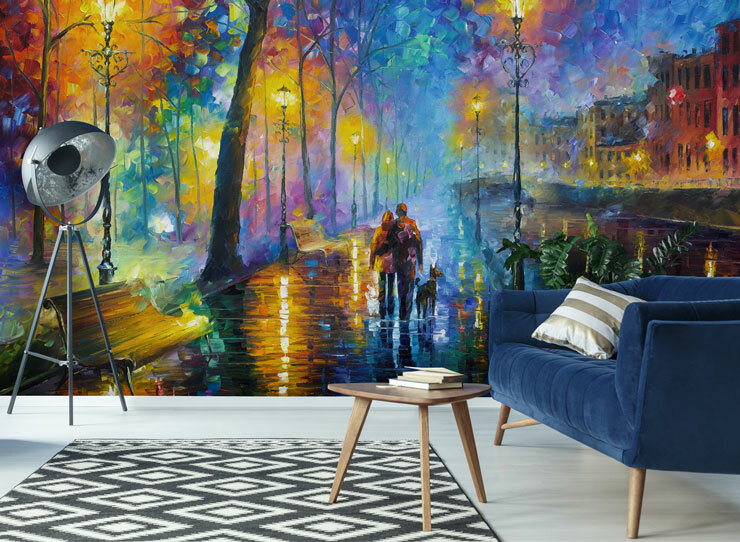 Although we only have a small sample of his paintings available as made-to-measure wall murals, if you have a favourite piece that isn’t shown on our website, we can request it on your behalf. 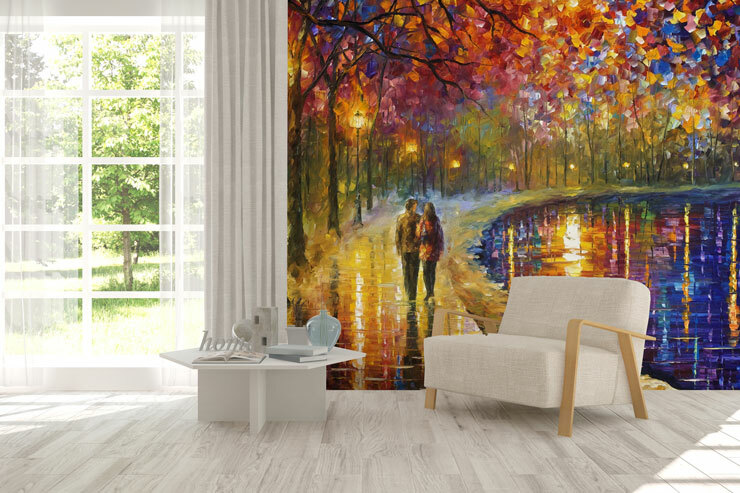 Alternatively, if this has been your introduction to Afremov, check out our collection of Leonid Afremov wall murals. They’ll make a great addition to any space!